What is the best way to structure primary care services? How can coordination between primary care and other parts of health care systems be improved? How should new technologies be integrated into primary care? 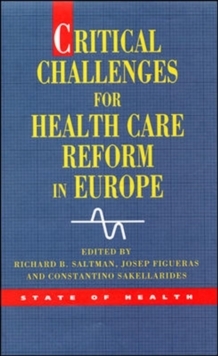 There is considerable agreement among national policy makers across Europe that, in principle, primary care should be the linchpin of a well-designed health care system. This agreement, however, does not carry over into the organizational mechanisms best suited to pursuing or achieving this common objective. Across western, central and eastern Europe, primary care is delivered through a wide range of institutional, financial, professional and clinical configurations. 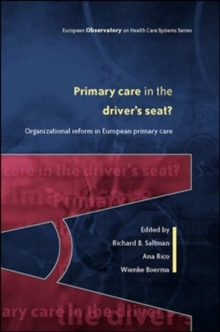 This book is a study of the reforms of primary care in Europe as well as their impacts on the broader co-ordination mechanisms within European health care systems. 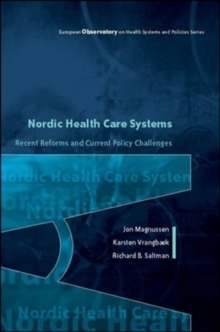 It also provides suggestions for effective strategies for future improvement in health care system reform. 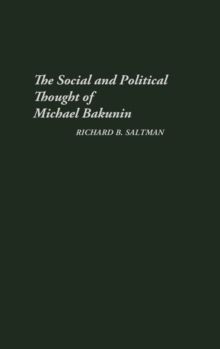 Primary Care in the Driver's Seat is key reading for students studying health policy, health economics, public policy and management, as well as health managers and policy makers. 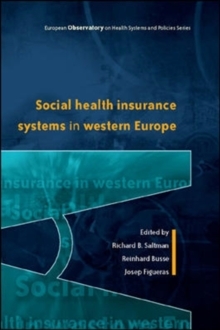 Contributors: Richard Baker, University of Leicester; Sven-Eric Bergman, Bergman and Dahlback AB, Stockholm, Sweden; Wienke Boerma, Netherlands Institute of Health Services Research (NIVEL) in Utrecht, Netherlands; Mats Brommels, University of Helsinki and Karolinska Institute in Stockholm; Sweden; Michael Calnan, University of Bristol; Diana Delnoij, Netherlands Institute of Health Services Research (NIVEL) in Utrecht, Netherlands; Anna Dixon, London School of Economics and Political Science; Carl-Ardy Dubois, University of Montreal, Canada; Joan Gene Badia, Catalan Institute of Health in Barcelona, Spain; Bernhard Gibis, National Association of Statutory Health Insurance Physicians (KBV), Berlin, Germany; Stefan Gress, Institute of Health Care Management of the University of Duisburg-Essen in Essen, Germany; Peter Groenewegen, Netherlands Institute of Health Services Research (NIVEL) and Utrecht University in Utrecht, Netherlands; Jan Heyrman, Catholic University Leuven (KULeuven) in Leuven, Belgium; Jack Hutten, Ministry of Health, Welfare and Sports, The Hague, Netherlands; Michael Kidd, University of Sydney; Australia; Marten Kvist, Laitila-Pyharanta Health Centre in Laitila, Finland; Miranda Laurant, Centre for Quality of Care Research of the Universities of Nijmegen and Maastricht in Nijmegen, Netherlands; Margus Lember, University of Tartu in Tartu, Estonia; Martin Marshall, University of Manchester; Alison McCallum, National Research and Development Centre for Welfare and Health (STAKES) in Helsinki, Finland and Karolinska Institute in Stockholm, Sweden; Toomas Palu, Europe and Central Asia Development Department of the World Bank in Washington DC, USA; Ana Rico, University of Oslo, Norway; Ray Robinson, London School of Economics and Political Science; Valentin Rusovich, Department of General Practice of the Belarussian Medical Academy for Continuous Medical Education (BelMAPO), Department of General Practice in Minsk, Belarus; Richard B. Saltman, Emory University, Atlanta, USA; Anthony Scott, University of Aberdeen; Rod Sheaff, Manchester University; Igor Svab, University of Ljubljana, Slovenia; Bonnie Sibbald, University of Manchester; Hrvoje Tiljak, Andrija A tampar School of Public Health, Zagreb, Croatia; Michel Wensing, Centre for Quality of Care Research of the Universities of Nijmegen and Maastricht in Nijmegen, Netherlands.